Ladder Livestock Company is a ranching operation in the Little Snake River Valley on the Colorado - Wyoming border near Savery, Wyoming. Members of the Salisbury family have been ranching in this area for over 120 years. A.W. Salisbury came to the area in the mid-1880's and established the original ranching operation. The ranch is primarily in the business of raising and marketing sheep and cattle. We do some farming, primarily of alfalfa and hay, and use it for winter feed for the livestock. The home ranch is located at about 7,000 feet altitude, which makes for high quality hay and a short growing season. The Ladder Ranch is in the business of raising Angus and Black Baldie cattle and Rambouillet and Hampshire sheep. We also raise grass hay and alfalfa on our hayfields during the short growing season, and feed it to our livestock through the winter. Ladder Ranch is a “horseback outfit” since our rough terrain demands that we tend and move livestock with horses. We raise many of our own saddlehorses, and also ride horses adopted from the Bureau of Land Management. Our operation follows the transhumance model, with the sheep and cattle trailing to the high country and summer forest permits in June and trailing out in the fall to spend the winter months in lower country. This is one of the longest livestock migrations in the United States, as the sheep move some 150 miles from the National Forests to the Red Desert. We manage grazing on BLM and Forest Service allotments for much of the year, in addition to the resources on our own private lands. The sheep trail about 150 miles from their 9,500 feet summer altitudes to the 6,000 feet winter pastures on Wyoming’s Red Desert. 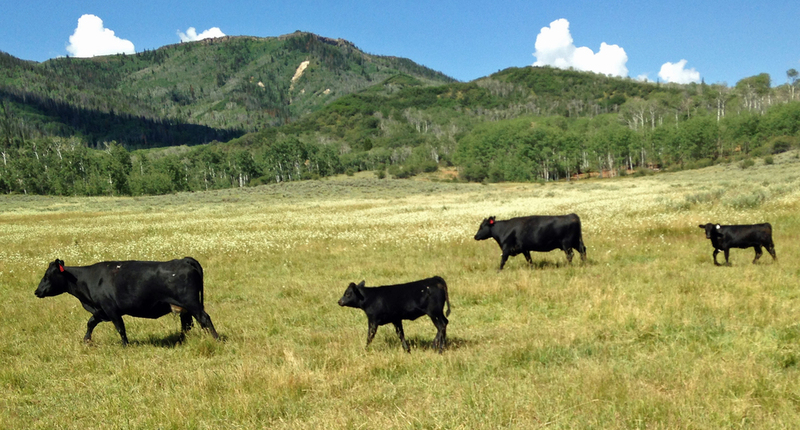 The cows and calves graze on the Routt and Medicine Bow National Forests in the summer, and return to the ranch headquarters and leased pastures for the winter. Our ranch and nearby lands provide habitat to one of North America’s largest elk herds, and one of the only thriving Mule Deer herds in the region. We are home to species including Greater Sage grouse. Colorado cutthroat trout and Gambel’s oak, which are thriving. Ladder Ranch received the 2014 Leopold Conservation Award presented by the Sand County Foundation. The Leopold Conservation Award Program recognizes agricultural landowners actively committed to a land ethic. The recognition is given in partnership with the Wyoming Stock Growers Association’s Environmental Stewardship Award and recognizes landowners who value good conservation practices on a working landscape. Ladder Ranch also participates in the Sage Grouse Initiative, the Conservation Stewardship Program, and the U.S. Fish and Wildlife’s Partners for Fish and Wildlife program.